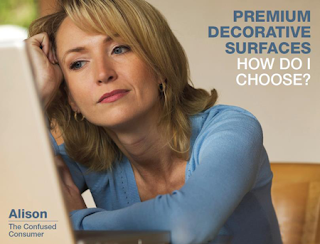 So what are Premium Decorative Surfaces? When you move beyond the realm of laminate countertops, you have entered into the world of Premium Decorative Surfaces. From quartz to granite, from solid surface to soapstone, these “higher-end” surfaces are what consumers look for when they want to bring a definitive and “upgraded” style to their kitchen and bath countertop. Not only is the countertop often the focal point of any kitchen or bathroom, it is the most highly used surface in the entire household. It is understandable, then, that there has been a strong consumer focus on searching for the “perfect” countertop material. However, once the search for the “perfect” surface begins, so also begins the phenomenon known as “consumer confusion”. Consumers now, more than ever, are confused about all of their options and are confused about the overwhelming amount of information that is available to them. 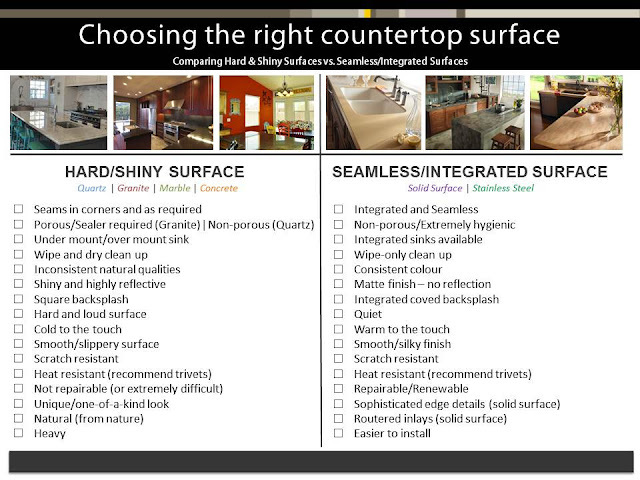 In order to combat this consumer confusion, there is a clear, defining line that separates two types of countertop surfaces: hard & shiny surfaces vs. seamless/integrated surfaces. These two categories of surfacing materials offer very different properties - properties that can be sued to identify which material would work best for any particular homeowner. With hard & shiny materials - such as granite and quartz - consumers will find these materials to be, in general, highly reflective, projectors of sound, cold to the touch, difficult to repair all while achieving a very "natural" stone appearance. 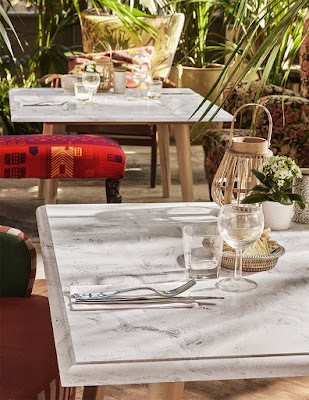 On the other hand, seamless / integrated materials - such as solid surface and soapstone - generally have a matte finish, are sound absorbent, are warm to the touch and offer ease of repairability and maintenance . By identifying these two categories of surfacing materials, consumers can begin to identify how each type of surface would fit into their lifestyle. As with every decision we make in our everyday lives, we are faced with weighing the outcomes of our decision. So why should choosing a countertop be any different? If the design industry can lean away from suggesting a product and begin to suggest a product for your lifestyle, then you can make an educated, assured decision. It is with this simple idea that you, as the consumer, can stop being confused and can become confident in choosing the perfect countertop surface for your home.